पOWEर Music™, the latest offering from Boss India, is all set to revive India’s club culture with a series of game-changing musical journeys. The first tour to be announced features one of the highest selling artists in Europe right now -Ofenbach. The French duo have over 1 billion streams, 15 Platinum and 12 Gold Records and are storming the global scene with their unique blend of retro rock and contemporary deep house. Rest assured, you have not heard music like this before! After their record breaking World’s Biggest Guestlist Events (featuring Hardwell, W&W, Kill the Buzz and more) and पOWEर Arena™ Tour (with World #1 Martin Garrix), Boss India brings the focus back to the music with the पOWEर Music™ Tours, in India’s hottest clubs and unique locations. Let us come together and awaken the true power within. For we are the people of पOWEर. 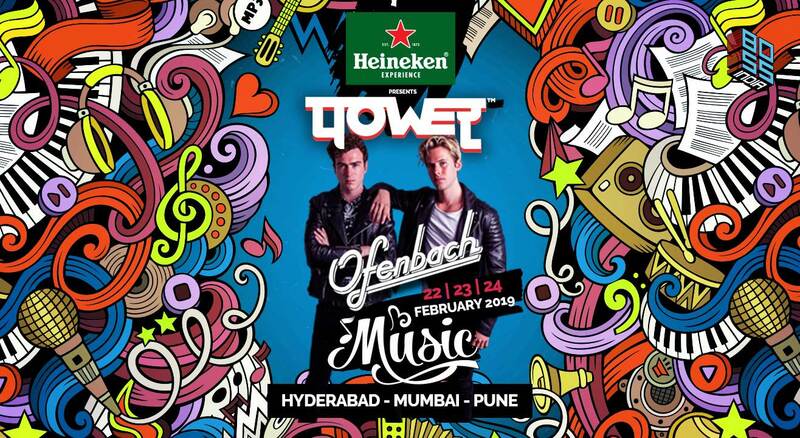 What are the dates and location for Power Music – Ofenbach India Tour? Power Music is strictly for over 21-year-olds. Purchase and consumption of alcohol products will be strictly controlled at all times. We will require any government photo ID proof, which will be checked when entering the event as well as at any time on venue grounds. How and where do I collect my tickets/wristbands? Alcohol, food, bottles, cans, glass, animals and sound systems may NOT be brought onto the event. Is re-entry allowed once on the premises? Will I be able to purchase food and beverages at the Venue? PLEASE NOTE: You may NOT bring your own food or beverages. Are there restroom facilities on site at the event? What are the ticket options and information? Will there be a ticket exchange counter at the venue? Can I buy tickets using cash? Via Debit/Credit card or various other services available at PayTM/Insider. What do I do in case of duplicate payment taken? What is the ticket cancellation/refund policy?